While Lamborghini is about to debut the Centenario Roadster during Monterey Car Week, the British public can see its hardtop sibling for the first time at Salon Privé from September 1 through 3. For those who prefer classic Lambos a one-off Miura Roadster and the restored Miura SV from the 1971 Geneva Motor Show will also be at the posh event in Oxfordshire, England. Lamborghini is celebrating the 50th anniversary of the Miura all year, and Salon Privé marks a major British portion of the birthday festivities. 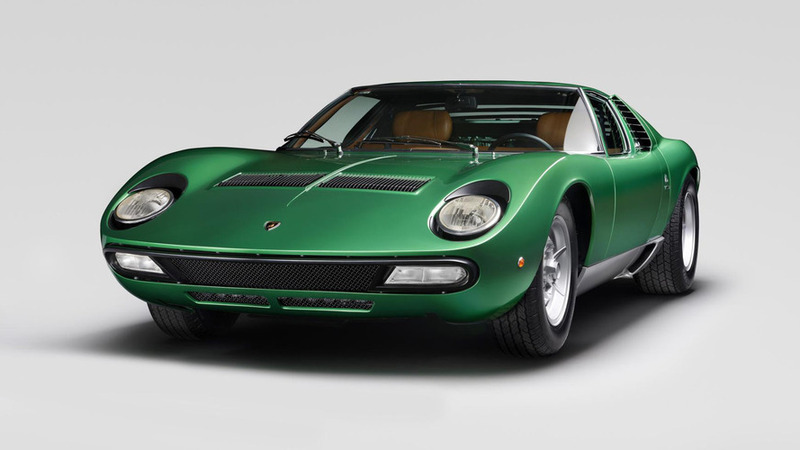 The Lamborghini PoloStorico heritage division spent a year restoring the green 1971 Miura SV (above) for this anniversary and debuted the result of the team’s hard work at the Amelia Island Concours d'Elegance. Lambo meant the car as a one-off for the Geneva show, the design combined elements from the contemporary Miura S with touches eventually for the production SV. PoloStorico will also bring the Miura Roadster to Salon Privé. Nuccio Bertone penned the open-top design, and Lambo showed it at several auto shows. Several private owners kept it through the years, but now the special vehicle often sits in the automaker’s museum. There should be a lot of Lamborghinis to see at Salon Privé because the marque also has a dedicated class at the event’s Concours d’Elégance, including over ten Miuras. Another show during the event will also have a dedicated Diablo category with 10 cars on display, including a VT Roadster and VT Final Edition. There’s a little more Lambo love, too, because attendees can test drive the rear-wheel drive Huracán LP580-2 and all-wheel drive LP 610-4 Spyder. The 15-mile test-drive course should be fun in either member of this pair. Bringing the splendor of Sant’Agata Bolognese to Oxfordshire, Lamborghini celebrates past and present at this year’s Salon Privé, with activities including concours entries, a debut and supercar test-drives. With cars to admire, marvel at, and even test drive, there’s something for all Lamborghini fans, and Salon Privé is delighted to announce the full Lamborghini event plan for its amazing event from the 1st to 3rd September. Salon Privé and Lamborghini PoloStorico, the marque’s heritage division, will be celebrating the 50th anniversary of the Lamborghini Miura, universally regarded as the first-ever supercar. With its own class in the prestigious Chubb Insurance Concours d’Elégance, 50 Years of the Lamborghini Miura will see over ten of the world’s best examples entered into the Miura-only category, with two examples making their way from the USA in order to compete. As part of the celebrations, the PoloStorico division will display the iconic one-of-one Lamborghini Miura Roadster, which will take pride of place on the lawns of Blenheim Palace. Also on display as part of the 50 Years of the Lamborghini Miura class celebrations is the original Miura SV shown at Geneva Motor Show in 1971. It will be showcased at Salon Privé following its recent comprehensive restoration by Lamborghini PoloStorico. The unique pre-production model was originally built with parts of the Miura S, but incorporated pioneering features that would be seen on later SVs. Not to be outdone, the Pirelli-backed Prestige & Performance Competition on Saturday 3rd has its own Diablo-only class, The Diablo Tribute, where a 2000 6.0 VT Final Edition will battle it out in the modern-day concours against nine other entrants, including chassis number 001 SVR, the first of just 31 racing versions produced, a limited-edition SE30 30th anniversary model and also a VT Roadster. Throughout the event, Lamborghini’s official Birmingham dealership will manage guests’ test drives in the rear-wheel drive Lamborghini Huracán and its four-wheel drive equivalent, as well as the Spyder version. The 15-mile test-drive opportunity is part of Salon Privé’s ‘see it, test it, drive it’ experience. Salon Privé is the only event of its type that allows its guests to drive cars on the public road in the UK. For media wishing to attend this year’s event, media accreditation is now open and press can apply via the online booking form by providing their credentials and preferred attendance date. Media invites are limited, so interested parties are advised to apply as soon as possible.